Guess whose back, back again... shoulder pads. Well not really. Not in an 80's power suit sort of a way, or at least I hope not. But a softer version seems to have made a revival, seeing that most of the blazers I've looked at recently have the little blighters included. I usually put any clothes straight back on the rack the minute I feel any suspect cushioning, but this H&M blazer was an absolute bargain in the sale at £15!! so I asked myself, "what would Maggie Thatch do?" and I went for the pads. I've since made my peace with the pads and am pretty keen on the boxy masculine shape of the blazer. I'm eagerly awaiting warmer weathers when I can brave dresses underneath it, but for now I've been wearing it, a lot, over the comfiest of jumpers. 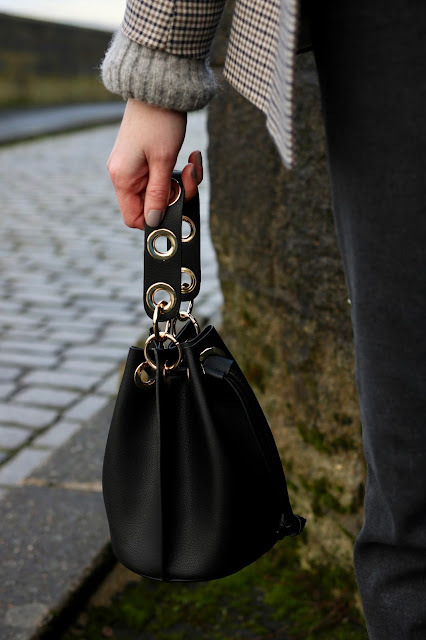 My clothes do tend to air on the androgynous side slightly, so a handbag is a life saver for me as a giveaway that yes, I am a woman thank you very much. I'm looking at you random toddler in Office World. Quote, "That's not a woman thats a man." End quote. I bought this mini bucket bag from Zara recently, which holds deceptively more than you'd think. I'm usually a giant bag wearer, for all the things I carry around just in case!! If there's ever an apocalypse or other cataclysmic event, or you need a safety pin, stick with me gals. It feels quite freeing to use a smaller bag for a change though. Less room = less stuff = less time routing. I vividly remember one of the first small bags I used early teens. It was bright red, from Gap and pretty snazzy if I do say so myself. I took it to a friend's birthday and was horrified when a male friend asked, "What have you got in your bag? Tampons?" Well no actually I didn't. Just spending money and a lip gloss. Ah those were the days! Pre-safety pin, paracetamol, and pepper spray carrying days. As always, thank you for reading! and thank you to my other half for taking these photos on a pretty chilly day when I'm sure he'd really rather not. P.S I don't really carry a pepper spray... unless you're a potential crazed attacker in which case I do!